Not to be missed performance. Tell your friends and family and let's fill the bleachers and cheer them on. the CPMC board members for the 2019/2020 school year. Nominations can be made at the general meeting on April 10 (7:30pm in the CASH library). If you know someone who would be a good board member, discuss it with them, get their approval to be nominated and let me know. Then come to the April 10 meeting and formally nominate them. After that meeting, nominations will be announced via email. The outgoing and incoming board members work together to transition responsibilities in June, and the new board takes over in July. If you'd like to be involved and not sure how, attend this meeting. We are in great need of new parent help. Many current volunteers are senior parents and will be leaving. Don't let the band down with no adult leadership! Start saving your clothes in 13-gallon trash bags. We will be collecting them in August for our fundraiser. This is small list of what is accepted but please visit www.clothingdrive.net for a full list of what they do and do not except. Tell your friends and neighbors to donate too. The more bags, the more money our organization can make. Check out our spirit wear for jackets, Coatesville sweatshirts, chaperones shirts, and more. All chaperones are to wear the collared polo shown on the flyer. Our website, www.cvillepmc.org also has an online link with more options and easier ordering. Orders are now being taken for the infamous "RED" or "BLACK" polo shirts that our Band Directors, Instructors, Volunteers, Chaperones & Pit Dads wear as part of their uniform when working/traveling with the Band. Parents/family/friends can purchase a Candy Gram for their band student and write a note, encouragement, something fun on a label and stick it to the selected candy. This cart will be located in the band room. It is open after practice on Mondays and Wednesdays, Friday before football games and Saturday before competitions. Candy can be purchased for $1 and parents/family/friends can purchase a Candy Gram for their band student and write a note/encouragement/something fun on a label and stick it to the selected candy. These will be handed out to the students after a game or competition. Wawa coupons, Red Raider glasses, flip flops and Drumline mugs can also be purchased at the Cart of Wonders. Students only can preorder Chick-Fil-A sandwiches for home games for $4. 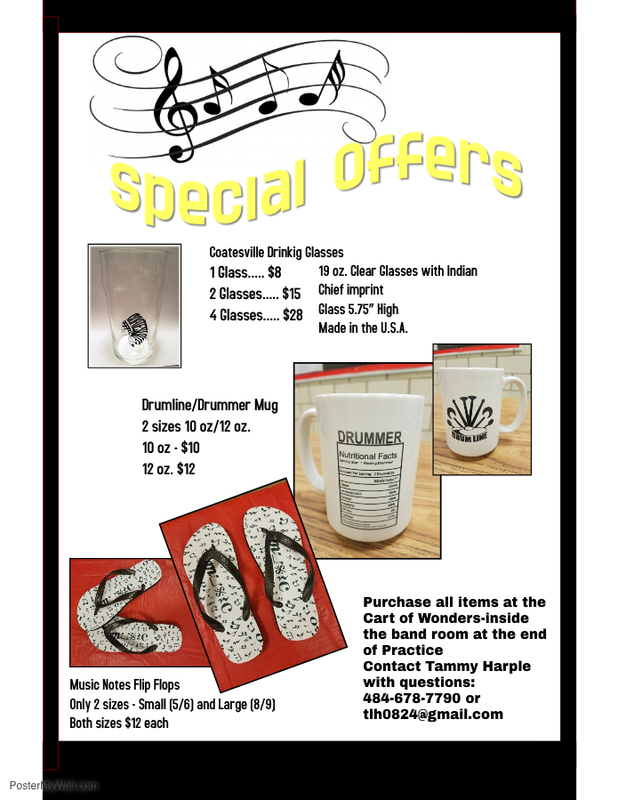 PURCHASE THESE ITEMS AT THE CART OF WONDERS IN THE BAND ROOM AT THE END OF PRACTICE. Shopping online for the Holidays? Sign up for Smile Amazon. This is an absolutely FREE fundraiser and signup is EASY. A percentage of all orders purchased through Smile Amazon comes to the Coatesville Parent's Music Club for our general budget. Great way to put money into your student account to pay for dues! Who needs a fast and delicious meal? Have your Wawa coupons on hand! Wawa Hoagies coupons are a great way to earn money for your student account. Each coupon purchased puts $1 into your account. Fill out the attached order form and place it with your money into an envelope and put it into the CPMC mailbox or get them at the Cart of Wonders this summer. This is an on-going fundraiser so keep selling and raise money for your account. Contact Tammy Harple with questions at tlh0824@gmail.com. Involvement is the only way we can make this busy organization work. Don't sit back and watch, we need you! In order for us all to stay in the loop with quick communication, Mr. Hughes has set up a “Marching Band” class on the mobile app “Remind”. Remind: Mr. Hughes asks that all 2018-2019 Marching Band students to join. Remind can send messages via text message, email, or the app (can be found in both the Apple and Google app stores). If you have questions feel free to email, hughesg@casdschools.org. You can also join by going to the website, www.remind.com. The class should be joined by anyone who is participating in the marching band this fall. To join the marching band Remind class, send a text message to 81010. In the message, enter @905a6 (that is the class code). You will receive a message from Remind, verifying that “You’ve joined Marching Band”. T-shirts, hoodies, pajama pants and more. CPMC has set-up the ability to accept payments through Paypal by using your own Paypal account or by using a debit or credit card. Of course, cash and check will continue to be acceptable forms of payment. The Coatesville Parents Music Club (CPMC) makes every effort to support the marching band and all of its activities as best it can. However, there are some fees that need to be passed onto the students and their families. CPMC recognizes that families need different options for paying for these fees such as participating in fund raisers or various options to make payments. This page is for current band students and their parents/guardians. Click on this link or search Coatesville Parent's Music Club (Red Raider Marching Band Members). There are some questions to ask to be allowed to join. We will confirm you as student in the band or a parent/guardian. Our website is constantly updated so please make a point to check it out regularly. Our calendar is kept up to date here as well.